Pilot Scale Freeze Dryer are specially designed for drying processes of large-scale production units(20-100 litres). Prefreezing and drying will be realized on liquid temperature controlled shelves inside the separate drying chamber (double-chamber-system). Due to the temperature control of the stainless steel shelves (via a synthetic heat-transfer medium), these pilot systems fulfil the highest standards of the pharmaceutical and biotech industries. Freeze drying is the process of removing the moisture from a biological product while maintaining the Integrity of the products biological & chemical structure and activities. WEIBER Pilot Scale Freeze Drier are conceptualized and designed to provide moisture removing solutions to all the microbiology, biochemistry, biotechnology and genetic engineering laboratories which require complete moisture removal and storage facilities of various biological agents/material. Beside the normal drying applications our Pilot Freeze Drier are fit to be used for various applications tests involving micro-organisms, plants, tissues etc. 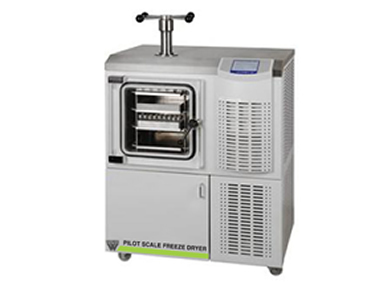 Weiber Pilot-scale freeze dryers are double walled cooled units. Outer body is constructed out of thick PCRC sheet duly pre-treated with primers and rust proofing and painted with long lasting stove enamel or elegantly powder coated. The inner chamber is made of heavy gauge stainless steel sheet of SS-304 grade. The gap between the walls is filled high grade mineral glass wool, which ensures maximum thermal efficiency. Electronic Vacuum indicator Pirani gauge is used. Specially designed temperature indicator to read temperature as low as 80°C, mounted on front panel. Suitable work on 220V single phase. 50HZ A.C.